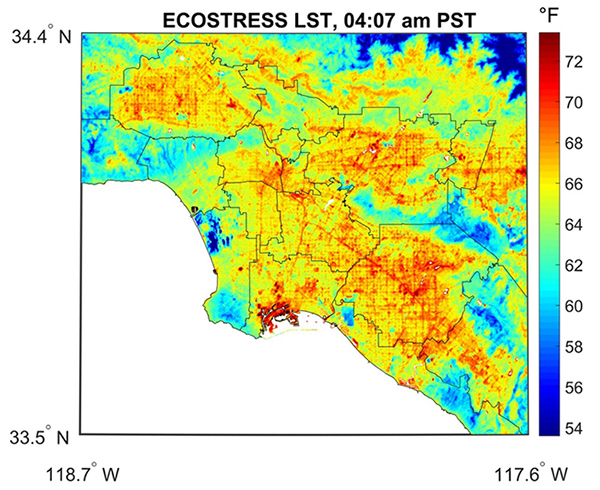 ECOSTRESS captured new imagery of variations in surface-temperature patterns in Los Angeles County. NASA's ECOsystem Spaceborne Thermal Radiometer Experiment on Space Station (ECOSTRESS) captured new imagery of variations in surface-temperature patterns in Los Angeles County. The first of its kind to be taken by one of the agency's newest Earth-observing mission, it is more detailed than previous imagery and, unlike prior imagery, was acquired at different times of the day. ECOSTRESS measures surface temperature -- the temperature you would feel if you touched the surface of something -- rather than the air temperature typically reported by weather stations. The images were acquired throughout the day between July 22 and Aug. 14 during an extended period of high temperatures in the Los Angeles area.